The 2018 MBI Al Jaber Public Lecture at the Seminar for Arabian Studies was delivered by Robert Carter, Professorial Research Fellow at UCL Qatar. 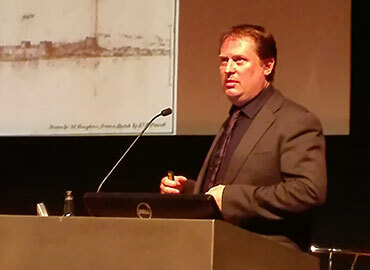 The presentation was held in the BP Lecture Theatre at the British Museum. In the 12th century, very few people still lived as nomads and towns and villages began to flourish. The first of these were maritime-orientated. Over time, on the Arabian shore of the Gulf, just two sites came to be considered urbanised settlements: Julfar and Qatif, and these established themselves as major pearl trading centres from the 17th century onwards. Economic power acquired from pearl-fishing determined changes in the ethnic composition of the Gulf towns, as well as in their size and number. Rob Carter told us that, by the 18th century, trade in pearls allowed this very region to take part in a global market. In circa 1820, pearl-fishing boomed and small urban centres arose in accordance with the growth of their local, pearl-fishing economy. Rob Carter believes Qatar to be a good example of this urbanisation process. Many cities such as Zubarah were founded or taken over by either the people of Kuwait or tribes coming from inland Arabia. Doha, the current capital of Qatar, for instance, started out as a fairly small town but went through fast-paced periods of growth and abandonment until it became the huge city that we know today. Doha is particularly interesting as it was, from the very beginning, organised into districts, according to the tribal composition of the local peoples. Over time, these districts assumed the names of the same tribes that first populated them. Today, as in the 1950s, most of the urban population still lives in enclosed, box-like houses: this is the so called ‘Areesh’ architecture. The archaeological sites studied by Professor Carter were actually very difficult to interpret, since, when a site was abandoned, the roofs were the only parts to be taken away and re-used, leaving all that was underneath them open to environmental and human factors. 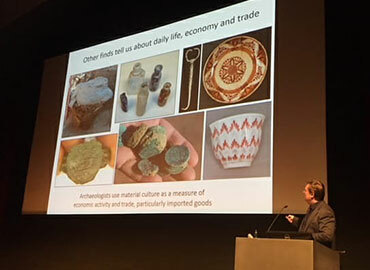 He also discussed the material culture of these towns: pearls, as well as the objects used to weigh them and estimate their value, were the most common finds on the sites. Professor Carter pointed out that, as traders started making money by exporting pearls beyond the borders of the Gulf region during the late 19th century, imported western and far-eastern pottery became more widespread and were much-appreciated, luxury goods. In fact, Rob and his colleagues found a great variety of imported pottery from Maastricht, in the Netherlands, as well as imitations of Chinese blue and white ceramics made in Japan. When the pearl-fishing economy eventually collapsed, people migrated to where they could make money from the new oil businesses elsewhere. Even Doha was abandoned initially, only to rise in prestige later. Rob Carter focused again on the Qatari capital and added that, after its ‘re-birth’, Doha turned to a new material culture that came from the West, like most cities of the Gulf, but its population continued to live in buildings situated in the old town that had managed to survive the passage of time. Professor Carter’s presentation was enthusiastically received by an appreciative audience. A reception sponsored by the MBI Al Jaber Foundation followed the event.